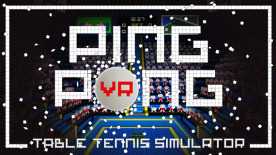 VR Ping Pong is a simulator that thanks to VR technology, and with the help of SteamVR Controllers, brings a ping pong table into your lounge. Each environment is styled as a stadium with fully animated audience members making for more immersive and addictive gameplay. the changes in the audience and the stadium is on the fly to increase the player's degree of immersion without ever distracting from the play area; during breaks, you can have fun discovering all of the hidden easter eggs in the surrounding environment. Practice mode: For the player that wants to train with AI point by point. Single match mode: For the player that wants to play a single basic match against AI. Tournament mode: For the player that wants to take on the challenge of becoming a champion. Arcade modes: For the player that wants improve their skills and compare their records with friends. You can select the difficulty level for each mode: AI changes skills (Variety of shots, depth of shots, etc) and features (Velocity, precision, power, etc) based on the chosen level.